Heading home for the holidays? Here’s hoping it’ll be a joyous reunion with friends and family, with plenty of cookies to go around. But if you’ve already been dreading those questions from your great-aunt about your love life, consider the ways we teach the Assistant to have natural conversations—it’ll make the talk your great-aunt a little less dreadful. In my years in the industry, I’ve learned a thing or two about how to make conversations work. And so has the Google Assistant. Here’s an example of a conversation that follows the Maxim of Quantity, along with one that doesn’t. Do Uncle Anthony: So, how is your first year of college going? Me: Great! I’m taking four classes. My favorite is called “Taking care of turtles in the 21st century.” Do you know what a turtle’s favorite food is? Don’t Uncle Anthony: So, how is your first year of college going? Me: Great! I’m taking four classes. My favorite is called “Taking care of turtles in the 21st century.” Some turtles are carnivores, and some are vegetarian. Sea turtles even eat squid. Leatherback sea turtles can grow to 1000 pounds! Do Me: So I went to this awesome concert. Have you ever been to a concert? Grandma: Yes, I went to see the Beach Boys in 1987. What a show! Who did you see, dear? Me: Wow, how interesting. I went to a show called Punky Kittens. Chef cousin who hates canned cranberry sauce: You like canned cranberry sauce? Don’t Me: Hey Joanne, I love <mumble mumble> cranberry sauce! Chef: What? I hate that stuff! Me: Oh yeah? I don’t see why, you mke it every year! Only use visuals when they’re appropriate. The Google Assistant is available on multiple types of devices, from the voice-only Google Home, to the voice-forward Home Hub, to the multi-modal mobile phone. Because of this, we need to consider when it’s most appropriate to introduce visuals, such as cards or carousels, to the conversation. Our go-to design principle is to add visuals when they enhance the discussion, and not to let them overshadow the rest of the conversation. Try to keep this in mind when you’re sitting down with family and friends. Don’t Me: Who wants to see my slideshow of my cruise to Costa Rica? I have 350 photos. Let me find that one on the beach where I saw a monkey. In fact, I’ll show you all 50 of them! Get some practice with your Assistant. 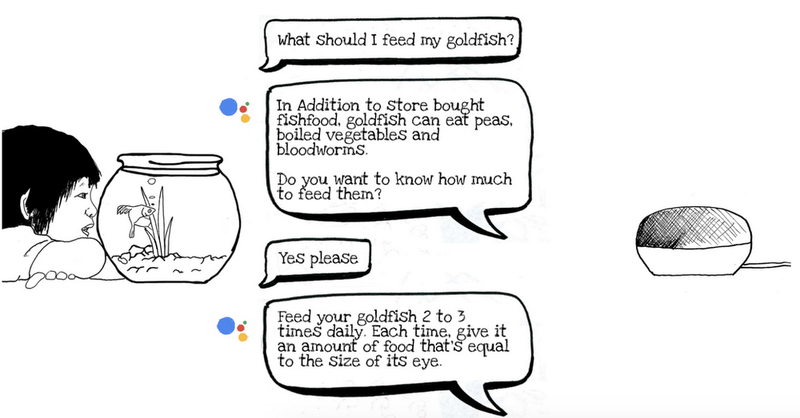 Before you head out for the holidays, try having a few conversations with your Google Assistant and see if you can spot these great communication principles in action. We hope that by following some of these best practices, your holiday dinners will be more pleasant and relaxed.